Power Analytics describes its plan to map power flows and build market values for distributed energy and resiliency. Two weeks ago, New York Gov. 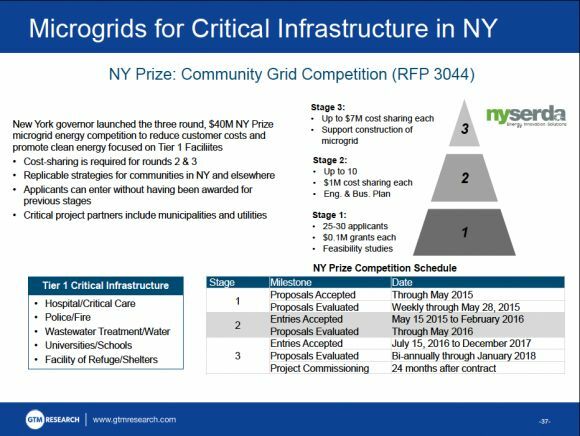 Andrew Cuomo announced the first five winners of the NY Prize Community Microgrid Competition. The five feasibility study grants of $100,000 apiece are among 30 to be named over the coming months, in the first stage of a program that will eventually hand out up to $7 million apiece to help build a string of energy-independent communities, hospitals, police and fire stations, water treatment plants and other critical sites across the state. The primary goal of these microgrids is to help the state weather future storms like 2012’s Hurricane Sandy. But they’re not just meant to be islands in the storm, according to the New York State Energy Research and Development Authority (NYSERDA), which is running the program. Winning projects will also be asked to plan ahead on how they can play an active role in the state’s day-to-day energy needs -- providing reliable power for their neighbors, bolstering constrained portions of the grid, replacing the need to build expensive new utility infrastructure, and other tasks that distributed energy doesn’t receive compensation for today. This is a complicated task, starting with models of how microgrids generate and exchange electricity within their own network, and building up to models of the system’s costs and benefits in providing a long list of grid-supporting capabilities, compared to traditional power plants and utility infrastructure. Kevin Meagher, CTO of Power Analytics, says his company has a plan for accomplishing that. As a long-time designer of power flow and microgrid modeling software used by U.S. Navy ships, military bases and college campuses, and a Department of Energy partner on solar and energy storage integration research, the San Diego-based company is one of a few companies with the tools to build a microgrid from the circuits on up. Since being acquired by Raleigh, N.C.-based Causam Energy last year, Power Analytics has expanded the professional services part of its business, with an eye on grasping the emerging microgrid opportunities in New York and elsewhere. 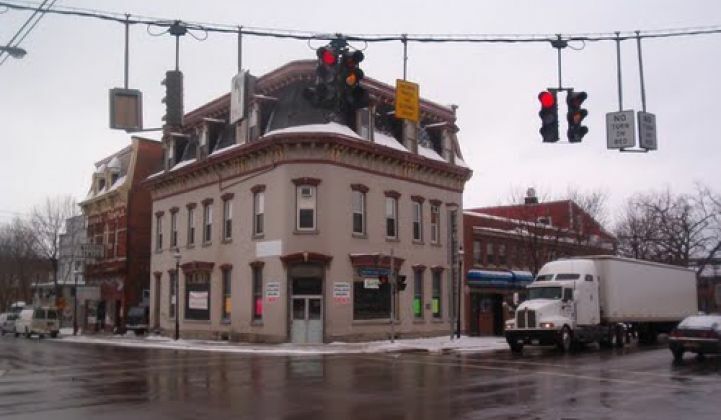 Last week, it announced it’s part of a consortium, including consultancy Booz Allen Hamilton and grid equipment and engineering giant Siemens, which won one of the $100,000 NY Prize grants on behalf of the municipal utility of Sherburne, N.Y. Starting with a combined heat and power (CHP) system and adding solar PV and other local generation resources, the partners will design a system that can support fire and police departments, the Village Hall, a health clinic, and a wastewater treatment plant for the village of 1,300 residents. But the feasibility study will include a lot more than backup power, Meagher said in an interview last week. The NY Prize isn’t giving money to microgrids limited to a single building or campus -- these are far simpler to engineer and organize, and they already exist today. Expanding the microgrid concept to include multiple buildings owned by multiple parties is a lot more complex, both in terms of the way electricity flows between the parties and the structure to allow them to share the costs and responsibilities for keeping it running. “There are three things that you need in there,” he said. “The most fundamental thing, from the capability perspective, is the power side -- it’s the idea of understanding what the circuits can do very dynamically.” That’s where Power Analytics' software plays a critical role, Meagher noted. New York is already the home of a number of large-scale microgrids being put together by grid giants like General Electric and Siemens, and other entrants, like Anbaric and Exelon, are exploring the opportunities in the state. “The second thing you need is data and metrology that’s very granular,” to ensure that every participant is aware of what energy services they’re providing, and what they’re asking their neighbors to provide, on a moment-by-moment basis. “The idea of being able to get a lot more data, a lot more than once a day, or even every 15 minutes, is that it opens up new transactive models” for trading energy, capacity and resiliency services. GTM has been covering some interesting technology developments on this front, including Duke Energy’s Coalition of the Willing work and a multi-utility project launched last month by the Industrial Internet Consortium. The third thing needed, “the big change, is definitely the community involvement, and how they engage in this. They’re participants,” he said. That includes “everything from how you buy services, to how you decide to go with solar panels or energy storage -- how you can get installed, how you get interconnected.” That could allow Sherburne’s municipal utility to create programs that compensate residents, local businesses and government entities for the energy systems they choose to install, based on their calculated value to the system. One analogy might be the value-of-solar tariff that Austin, Texas municipal utility Austin Energy has created for the city’s residents, only applied to a much broader set of distributed energy assets. Another analogy might be the plans being developed by California’s big utilities to calculate how distributed energy resources can be counted as integral parts of their distribution grid upgrade and maintenance plans. In New York, utility Consolidated Edison has won approval to replace an estimated $1 billion in substation upgrades with about $150 million in targeted demand response and energy efficiency programs and another $50 million in grid-scale battery systems, providing an early template of how distributed resources can work in lieu of utility assets. But the state's REV proceeding envisions a much broader platform for third-party energy resource integration, based around the concept of distributed system platform providers (DSPPs). Under this model, New York's biggest distribution utilities -- or, perhaps, an independent third party -- could essentially take on the role that grid operators like New York ISO do today to coordinate energy generation, transmission and consumption, only on the local low-voltage portions of their grids.That’s going to require a new kind of open and interactive technology platform, one that can share data and clear markets with third-party distributed energy owners and operators. Managing thousands of isolated distributed energy assets could be an overwhelming task. Microgrids that aggregate these complexities into a single point of contact could make that interaction a lot simpler for these future DSPPs. Here’s a short description of the other projects that won feasibility study grants. - The Long Island Community Microgrid Project. Under consultation with The Clean Coalition, utility Public Service Enterprise Group of Long Island will be studying the feasibility of combining 15 megawatts of solar PV with a 5-megawatt, 25-megawatt-hour energy storage system to support power quality, grid reliability and resilience in the East Hamptons on Long Island. - The Buffalo Niagara Medical Campus. Led by National Grid, this project will look at combining solar power and an on-site CHP system to support the 12,000-employee medical campus and surrounding community. - Bath Electric Gas and Water Systems will build on a previously announced project to produce electricity at the town’s wastewater plant, studying how additional on-site generation at office complexes or other locations could bolster that system’s availability for local power needs. - Westfield Electric Department will study the feasibility of a 2-megawatt CHP facility to supplement the power needs of the village’s 3,200 residents in case of failure of the single transmission line that connects the village to the state’s grid.